Can you do a Feng Shui audit on The Spire in Dublin. Its in the middle of the O’ Connell St Dublin. I think its Sha Chi for the surrounding buildings. What do you think? Hi Fiona, Seeing you address this question directly to me, I will try to answer you with some broader appeal so we can use it to make a visual feng shui assessment of other structures. 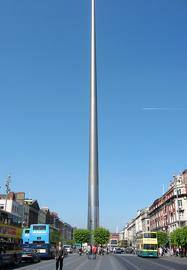 “Officially called “The Monument of Light” universally referred to as “The Spire” and unofficially called “The Nail in the Pale”, “The Rod to God” and “The Poker near Croker” amongst other more “colorful” names. 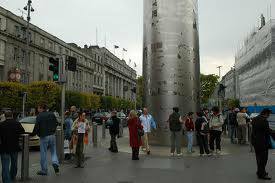 Like any other member of the family, once Dubliners realized the tallest sculpture in Europe would provide plenty of opportunity for creating cheeky nicknames they finally acknowledged it as their own.” – From the webpage of the Dublin Council. Every city wants an outstanding urban marker of their own, to give the city an identity, to attract tourist, to use as a reference point for the residents to find their way and so forth, eventually they become the land-mark of a city and the talking point. 1) It is a little too high and in your-face, but given its function, to be little bit out of balance and controversial is fine, besides it is very simple and direct. 2) It does give Dublin an identity and a landmark so in terms of the council representing the people it is an appropriate thing to do. 3) Given the nicknames, it is endearing to the residents. There will always be someone who likes it and some who don’t, but the majority of the people seem to accept it as their own and many tourist flocks there. In assessing an object in the environment like this, a feng shui consultant should try not to be too subjective but to balance his or her personal likes and dislikes with some objective criteria based on feng shui preference, like being harmonious, appropriate and holistic (i.e. taken all 3 San Cai qi into consideration). You know we get to be asked all the time, “What do you think of the feng shui of this and that?” so a systematic and a structured approach is required in order that our answers are always consistent and view from a feng shui point of view and not just a personal remark. Knowing how to do this means we can adjust the feng shui accordingly, if given a chance.